Ever heard of these? They look like something you would find in an enchanted forest, namely Snow White’s. At least I’d like to think so. 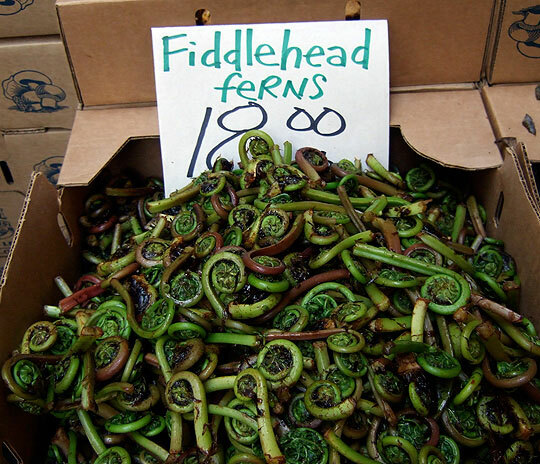 Ever since I saw a contestant on Top Chef use them in a dish, fiddleheads have been rolling around in my head. I’ve been wanting to get my hands on some of these for awhile and now that we’ve reached warmer climes, I might just try! I’ve read they taste like a mix of green beans and asparagus. I can just imagine the crunch! I love the unfurled tips. I think that’s why I like them so much. Cooking them is as simple as a sautee in butter and shallots. MmMmm I can imagine this alongside a nice piece of grilled salmon and creamy mashed ‘tatoes. But first, I need to get my hands on some. I know you can order them online, but I’ve never ordered veggies online before, have you? I always like trying new things in the kitchen and this one is pretty high up on the list right now…except for one teensy tiny thing. 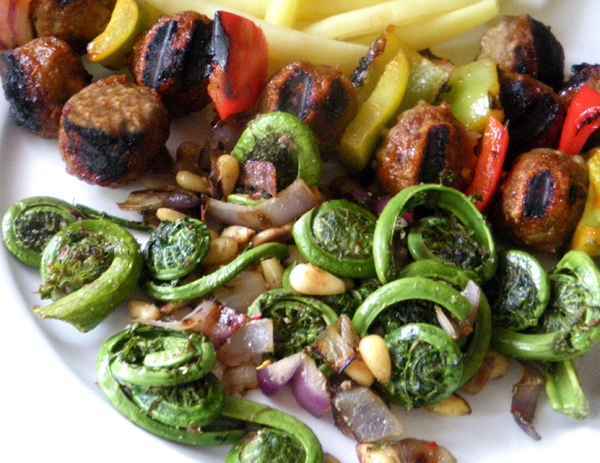 Apparently, these adorable ferns come with a toxin that will wreak havoc on your tummy unless you cook it thoroughly. Uhm, ok.
Will this little caveat keep me from tryin them out? I remember having this @ Broad Appetit a long time ago! Also, I saw these being sold @ the Forrest Hill Farmers Market so you should go there and check it out! It’s called the SOJ Market Umbrella and it’s on Saturdays from 8 to about noon. And don’t forget to invite me when you cook them hahah. Oh ate! Brave indeed! ew. they look scary. So how did they taste?